This section provides an overview of the panels that can be used to build a cockpit which closely resembles the real thing. No longer will you need to click a button with your mouse, and there won’t be any gauges cluttering the outside view either. All of the modules are Microsoft FS2004/FSX compatible. These Saitek modules are appropiate for the simmer who wants more then a simulated instrument on a computer monitor. The Saitek PRO flight product range is easy to use and adds a lot of realism to the simulation experience without driving you at very high costs. Description Upgrade the flight simulation experience for Microsoft Flight Simulator X with the Saitek Pro Flight Switch Panel. Whether attached to the Saitek Pro Flight Yoke System, free standing on a desk or mounted into your own cockpit setup, the Pro Flight Switch Panel is an ideal way to expand the number of controls for your flight simulation experience. Control your landing gear, engine power, landing lights and 11 other important aircraft functions from one compact unit. You can upgrade the flight simulation experience for Microsoft Flight Simulator X with the Saitek Pro Flight Radio Panel. Instrument Panel can display six of the main cockpit instrument panels from Microsoft’s Flight Simulator X. Features a 3.5” colour LCD screen. Use one or more, depending on what you want to view simultaneously. Upgrade the flight simulation experience for Microsoft Flight Simulator X with the Saitek Pro Flight Switch Panel. Whether attached to the Saitek Pro Flight Yoke System, free standing on a desk or mounted into your own cockpit setup, the Saitek Pro Flight Switch Panel is an ideal way to expand the number of controls for your flight simulation experience. Control your landing gear, engine power, landing lights and 11 other important aircraft functions from one compact unit. A set of switches and LED displays for use in controlling various aspects of flight simulationIncludes: COM1/COM2/NAV1/NAV2 function and DME/ADF/XPDR functions. Works with Microsoft Flight Simulator X and 2004. LED displays work fully in real time with Flight Simulator X and 2004, removing the need to bring the radio stack up on screen. 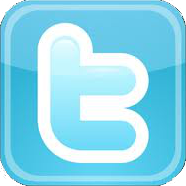 Standby switch - set your standby frequencies and then set to active at the touch of a button. Twin concentric adjustment dials adjust frequency units incrementally for the quicker selection of your required frequency. Three user defined colours - Red, Orange and Green. Over 70 different legends included in the box. Interfaces USB USB USB USB. Much more realistic than on screen signalling. Not very well suited for turbine engine powered aircraft. Not every signal type is supported with an out of the box display unit. A TFT-based instrument panel is a very good alternative when it comes to quality versus price. Most flight simulation programs have a way to display the instrument panel on a separate monitor. This way, you have your instruments, looking good in high resolution, on a panel straight away! 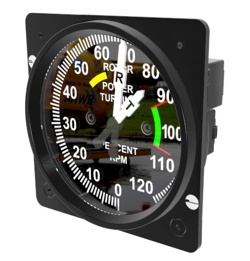 A further enhancement is the option to hide the TFT panel behind a cockpit panel with holes cut out at the right spots for the relevant gauges. 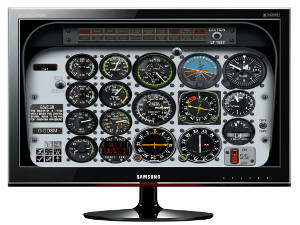 FlightGear, for example, comes with a utility that lets you place gauges on a TFT panel for this purpose only. 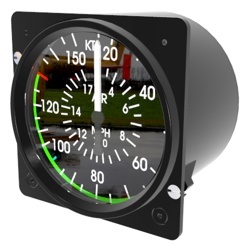 This flight instrument equipment approaches a very high degree of realism, both in terms of function and form. It is used by the most demanding DIY flight simmers and professionals alike. 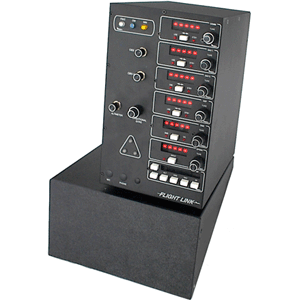 Description The TR-1 Avionics Stack is our most affordable avionics panel. With high intensity red LED (light emitting diodes), the TR-1 is the most inexpensive digital avionics stack on the market. The TR-1 contains the standard radios found in most aircraft and is a must have for a pilot who wants IFR training. All buttons and switches are fully functional. 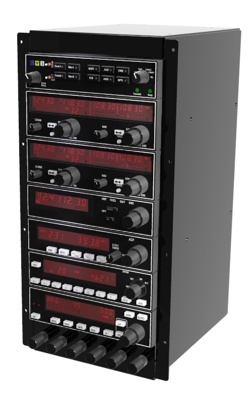 TRC's Radio Stack RS372 for Flight Simulation is so realistic that you can hardly tell the difference between the simulated Radio Stack and the real Bendix King Silver Line* products. Modelled after the most popular Radio Stack, as used in the Cessna 172 Skyhawk*, all of the details are reproduced extremely closely to the exact dimensions of the original radios. The stack is constructed as a modular system. Each radio is a separate module and connected via a ribbon cable to the built-in Radio Stack Controller, which is a microprocessor board that connects to your PC via USB running Flight Simulator Software. You can therefore change the order of how the radios fit in your panel. Realistic dual concentric radio knobs. Generic autopilot w/ ALT, HDG and NAV holds. OBS 1 & 2, altimeter and DG concentric knobs. Fully functioning red and green gear lights. All metal case with an industrial finish. All generic radio function available in one unit. Modular system; each units closely resembles specific radio equipment. Also incorporates gear and marker beacon status LEDs, potentially breaking modularity. High price level when using all of the modules. The most realistic level of simulation is to actually build an instrument panel with real switches and gauges. Of course, these gauges are under the software control of the flight simulator, but feel like and closely resemble the real ones. This is also the most expensive and labour intensive option. 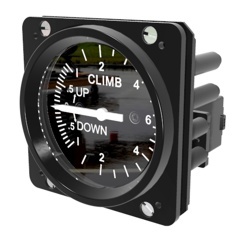 The gauges can be purchased from an Original Equipment Manufacturer (OEM). In the early days of flight simulation, all manufacturers used some sort of proprietary system to connect the gauges to an interface device that supported a USB (or another serial link) to connect to the flight simulator program. These days, most gauges all have their own USB connector (note that this means that they all have their own microprocessor and firmware on board). A separate power supply is used to power the gauges' servos.